Some Philadelphia policies may conflict with federal law in the interest of protecting immigrants and their families – last year the Department of Justice argued that at least two Philadelphia policies protecting undocumented immigrants are in violation, including use of the Edward Byrne Justice Grant. Toomey’s amendment targets the use of federal grants in sanctuary cities, and would withhold certain federal grant funds. 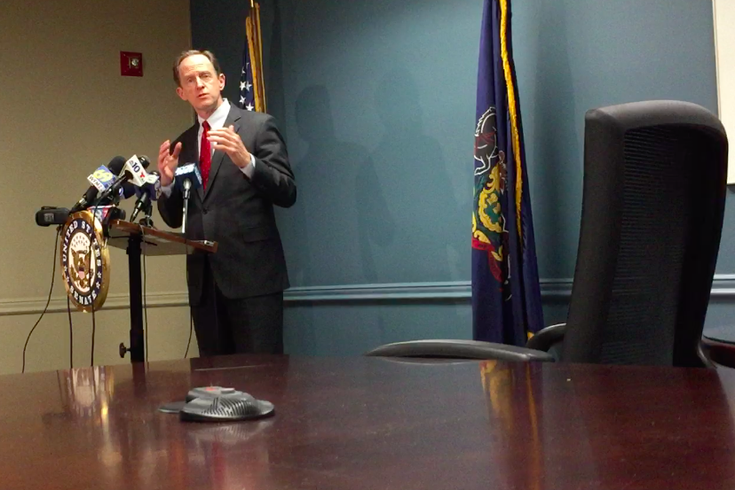 “Sanctuary cities such as Philadelphia and San Francisco endanger all of us by conferring a special protection to illegal immigrants even when federal immigration officials identify them as dangerous criminals,” Toomey said in a statement. Philadelphia Mayor Jim Kenney has been one of the largest public proponents of sanctuary cities, stressing the importance of creating trust between immigrants and police. In November, a U.S. District judge found Attorney General Jeff Sessions was not permitted to deny the city public safety grants just because of its sanctuary status. Toomey’s amendment was among the first on the floor during the Senate’s immigration debate Tuesday, though Senate Minority Leader Chuck Schumer objected, saying the measure “does absolutely nothing to address DACA, does absolutely nothing to address border security,” the Atlantic reported. The amendment, titled the “Stop Dangerous Sanctuary Cities Act,” also protects police when they act on behalf of the Department of Homeland Security “but the DHS has made an error,” according to the press release. This means an individual can still sue a law enforcement officer who violates a person’s civil or constitutional rights, but the officer will be protected if it was the federal government who made the error. The amendment also protects undocumented immigrants who come forward to report a crime. According to Toomey’s press release, the Federal Law Enforcement Officers Association, the National Association of Police Organizations, and the International Union of Police Associations support the amendment. Reports out of Washington generally assess that the immigration debate scheduled for the Senate this week has been full of false starts so far; debating and voting among Senate leaders has been slim. As of Tuesday afternoon, no votes had been made to find a solution that will protect the about 700,000 undocumented immigrants brought to the United States as children – before the DACA deadline on March 5. CNN reported that U.S. District Judge Nicholas G. Garaufis of the Eastern District of New York said President Donald Trump's termination of DACA was "arbitary and capricious," ruling that DACA recipients could renew their status. The ruling, in addition to a similar block from a California judge last month, means the program could extend beyond the March 5 deadline. Read more Politics Immigration Philadelphia Pat Toomey Police Mayor Jim Kenney Senate Sanctuary Cities Debate Washington D.C.